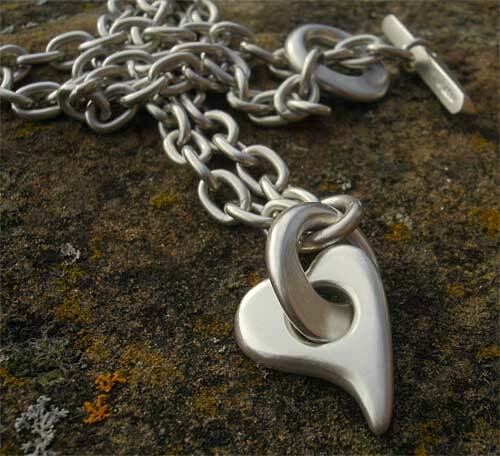 Sterling Silver Heart Necklace For Women : LOVE2HAVE in the UK! A women's T-Bar sterling silver, designer heart necklace. This necklace oozes designer styling throughout with its contemporary looks and is steel finish silver. The necklace comprises of silver rounds that integrate into the design. Both the T-Bar rondel and heart rondel feature smooth designer curving. The T-Bar come shaped, and the heart pendant has an attractive shape to it also. The chain measures approximately 16 inches and comes in solid sterling silver 6mm links. 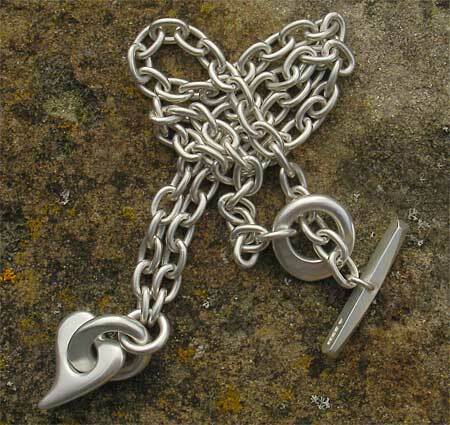 The silver heart and its silver rondel measure approximately 24mm in height. The entire piece itself weighs 40g. Just to reiterate the whole necklace is sterling silver and handmade in the UK. It is a unique piece of silver jewellery for women. There are still many small independent designers in the UK producing beautiful quality handmade silver jewellery at prices to suit all budgets. In the UK we have lost much of our manufacturing base.